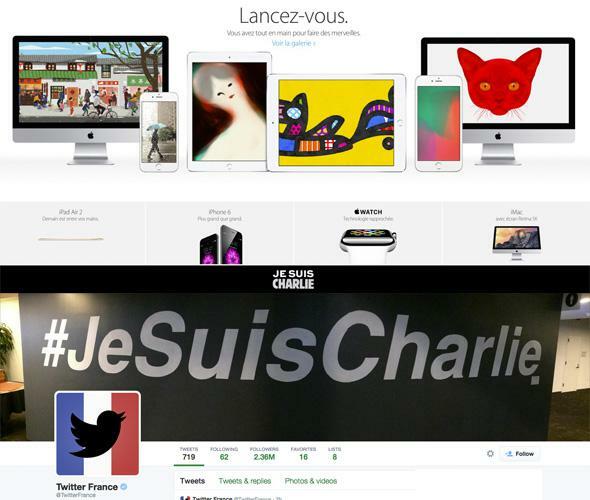 Charlie Hebdo support from Twitter, Facebook, Apple, others sends a mixed message. Tech companies showing support for Charlie Hebdo. As the attack on French satirical magazine Charlie Hebdo has evolved and sparked other violence in France, more and more people, groups, and companies have been expressing support for the victims. These messages, which often include the hashtag #JeSuisCharlie, are a statement of solidarity and strength in the face of violent censorship. Facebook has always been a place where people across the world share their views and ideas. We follow the laws in each country, but we never let one country or group of people dictate what people can share across the world. … I’m committed to building a service where you can speak freely without fear of violence. Of course the fact is that every large communication platform deals with real and persuasive censorship pressure. Facebook recently censored a Russian page that was rallying against President Vladimir Putin. (Later Facebook and Twitter agreed not to block similar pages in the future.) In August, Twitter promised to suspend any user account that shared images or videos of journalist James Foley’s beheading by the terrorist group ISIS, and Google is often accused of things like keyword exclusion in search results or overstepping in its implementation of Europe’s “right to be forgotten” laws. Social media has been around for a relatively short period of time, we have a pretty good idea of what its role is in democracy, but the people who create the guiding principles at social media companies—the codes of ethics that allow you to carry out your core values when there might be a conflict between those core values—the people who make those decisions, haven’t had a lot of time to develop true guiding principles. Welp, here’s another good opportunity, everyone.